The Crochet Liberation Front are inviting you to vote for your favourite crochet designers, books, podcasts and more of 2008. There’s a blog post with all the contenders, and then the survey itself. I’ve voted, but I amn’t going to tell you how you should, just that I suggest you do, if you’ve enjoyed crochet at all over the past year. 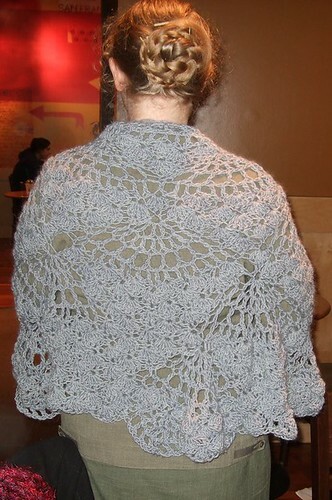 Even if somehow your only exposure to crochet was through this blog, well I’ve referred to the Getting Loopy podcast a couple of times (mostly when I won stuff, admittedly), and that’s a contender. And of course my Freeform Game from last year’s (Inter)National Crochet Month is in the CLF First Ever Book, and that’s in the running too, so you do know about some of the competitors. Ravelry members can see far more. PS Yes, I will be doing a second edition of the Freeform Game this March. Coming soon! There are a whole stack of books to catch up on, but I’m still engrossed in the shawl that’s been taking most of my non-working time recently. 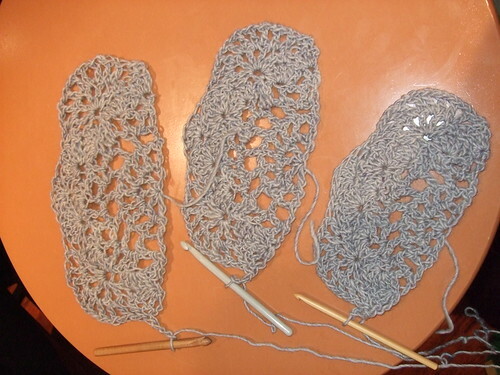 Last June I began working on Tracey’s Mystery Shawl, and for a variety of reasons it never got finished, largely because the yarn was annoying me in its slipperiness, and then because I mislaid the whole project. 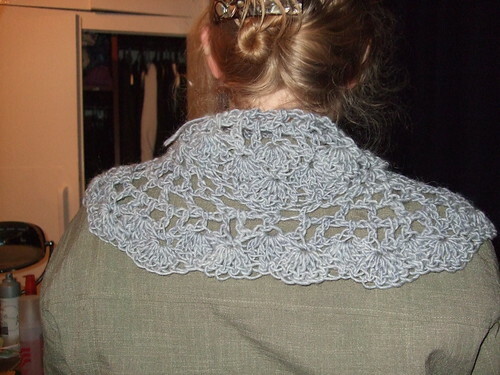 Then in January I told you that my brother had given me the yarn for another shawl. I held off from beginning it until I’d got my latest assignment handed in. That was on Tuesday nearly two weeks ago, and then I slept away the evening. 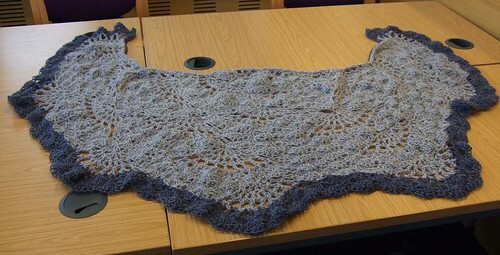 On Wednesday I printed out the full pattern and charts for this shawl (I had considered a few, and may well make some of the other contenders some time, but wanted to finally make this one), and took it, my bag of yarn, and some assorted hooks to the knitting etc group after work. I’m planning on blocking it this week. You can’t see the flurries, but it’s actually still snowing quite hard. I’m off work (can’t get there unless I walk for hours, and it’s closed now), so can do some masters work. 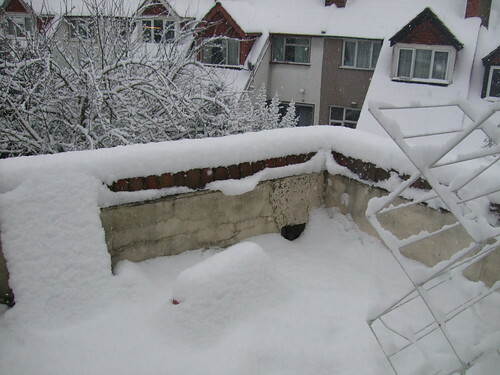 This is a whole lot of snow for London, and apparently it’s only going to get worse later. I’m rereading this and its sequel, as I just got the third in what is now apparently going to be more than a trilogy. It’s better than I remembered, but what I’m actually noticing now is how much Paolini’s writing had improved by the second book! Still, I haven’t finished so amn’t reviewing that one yet.